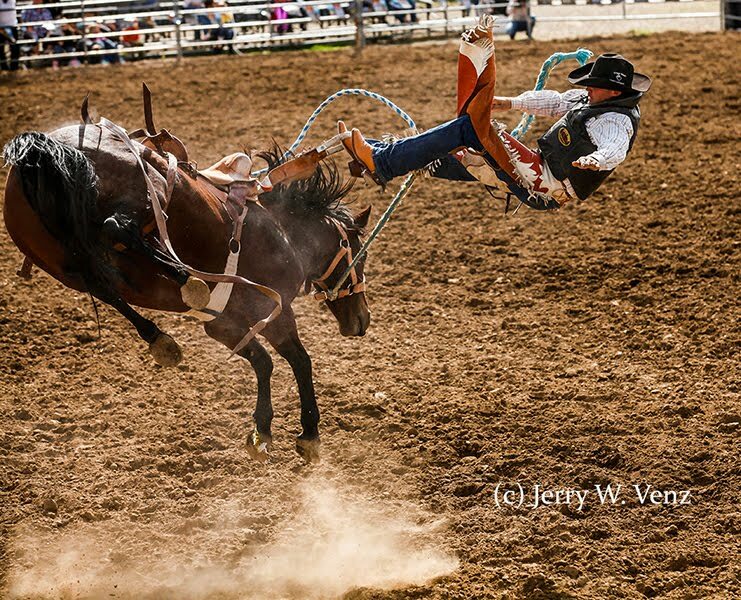 The Goboist: ACTION PHOTOS — FAST SHUTTER OR SLOW SHUTTER? YES! ACTION PHOTOS — FAST SHUTTER OR SLOW SHUTTER? YES! Your first decision is do you want to STOP the action to reveal the instant in detail? Or do you want to SHOW motion in a more abstract way—implying motion symbolically by bluring the subject or its background? These two techniques are probably the still camera’s greatest advantage over the human eye. The first technique (stopping action) is simply using a fast shutter speed. But, how fast and under what circumstances? Two factors determine this: Speed of your subject and (very important) DIRECTION of the travel relative to you camera. 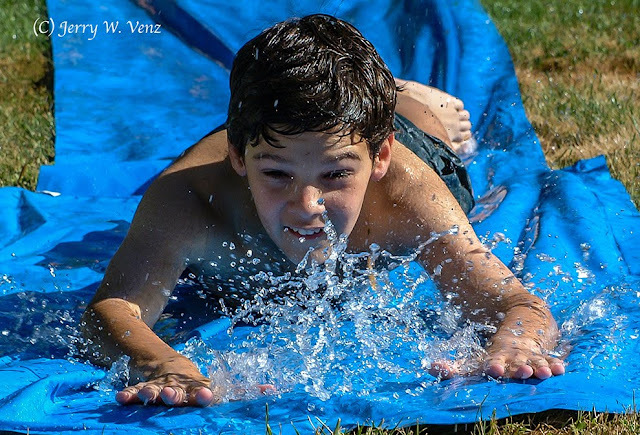 I probably could have stopped the boy with a much slower shutter speed here because he was slowing down (at the end of the slip-n-slide), but the water, that he is pushing, is accelerating and I wanted to freeze the water to look solid. In this next image we have one of the most challenging high action sports—rodeo. Because rodeo’s action is so intense and unpredictable I call it chaotic action. It tends to need even higher shutter speeds than motorsports. So, I tend to keep my shutter seed very fast so that when the action moves across my film plane, as in this image, I can stop any action. 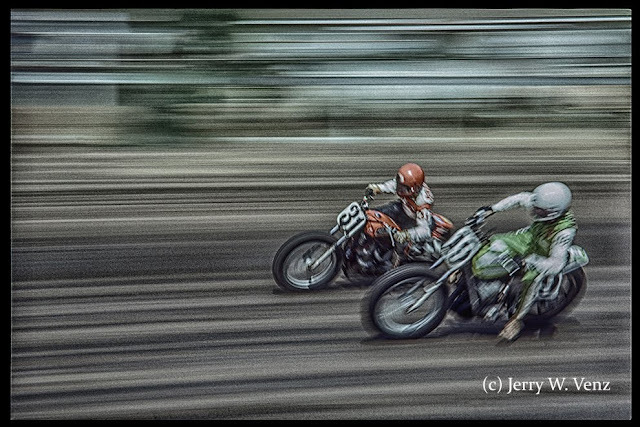 Ironically when I photograph the fastest sports—motorsports like race cars and motorcycles—I like to use my slowest shutter speeds, so that I can impart the sense of shear speed that is lost when you merely freeze their action. However, I don’t want to create abstract blurry images that a stationary camera would give me at slow shutter speeds. This is where the practiced art of panning with your subject comes into play. I discovered many decades ago that panning worked best in motorsports (or any sport on a track or course) where the action is predictable. To get a high yield in panning action you need to know the direction of travel of your subject and where they’re coming into your frame and leaving so you can smoothly follow through as you rotate your body following the action. My panning rotation is nearly 180º from when I first see the racers coming towards me. Then I click the shutter when they are at the 90º point (directly in front of me), which is their closest point relative to me. I then keep panning (the follow through) even after I click the shutter. The panning follow through is important—especially at slow shutter speeds like 1/15 sec. as in this image—because the pan creates the horizontal lines and streaks in the background. And, to make those lines and streaks smooth and straight across the image you need to keep the camera moving the entire time the shutter is open. My pans of race cars and motorcycles are usually at 1/60th or 1/30th sec. for a nice crisp subject. Using 1/15th sec. 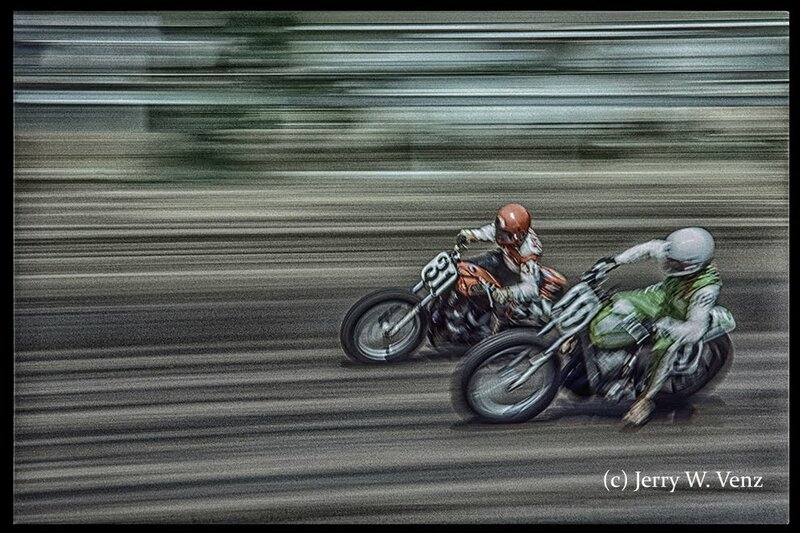 yields a more radical, artistic look because you get some “jiggle-blur” in the subject as seen here because these flat-track bikes are on a dirt-rack and are sliding and bouncing as they approach a turn at 100+ mph! BLACK AND WHITE PHOTOGRAPHY LOVES WEDDINGS!